While it may be a small tri-island Caribbean nation in terms of land mass and population, its lead diplomat in Washington, DC has a big embracing and engaging personality, which provokes any and all whom she engages to want to learn more about her homeland, making Her Excellency Gillian M.S. Bristol an ideal Ambassador of Grenada to the United States. For sixteen and a half years, Bristol worked for the Organization of American States (OAS), serving as secretary of several committees of the OAS Permanent Council, in meetings related to the General Assembly as well as the Program Manager at the Inter-American Committee Against Terrorism. 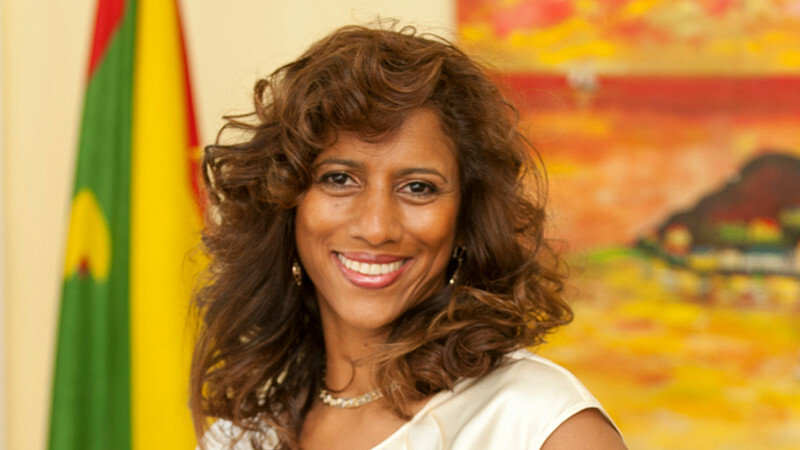 When the opportunity arose to serve as the Grenadian Ambassador, Bristol seized what she describes as a natural fit given her years of multilateral work to “bring my own experience and my vision to this role in service to my country.” For Ambassador Bristol it is truly an honor to represent Grenada. “I am so proud of my country and my people—we are some of the most beautiful, generous, ambitious, and driven people who are full of integrity and characterized by warmth and patriotism. And Grenada is the most beautiful island with the most beautiful beach in the world,” asserted Bristol. While one investment can have a large, positive bearing on the small island, so too can one natural disaster have an incredibly destructive impact. In 2004, Hurricane Ivan hit Grenada, despite its location outside the hurricane belt, destroying approximately 90 percent of the nation’s infrastructure. The following year, Hurricane Emily “took the rest.” Despite the human and economic toll these storms wrought, Ambassador Bristol takes pride in Grenada having fully recovered. Like much larger nations, Grenada encounters many of the same issues with crime, education, health care, and employment. But Ambassador Bristol points out that for her nation it is in a sense a much bigger task given their smaller resources, “We have to face the same issues and address the same challenges with far less.” And as she looks to help tackle these challenges, she is frequently confronted with another. “Oftentimes people think a small developing nation, like Grenada, is looking for a handout. But we are not looking for a handout; we are looking for a partner in our development. We are looking for friends to take this journey with us,” she stressed. For many Americans, any mention of Grenada evokes memories of 1983 when on October 25th U.S. Armed Forces invaded the tiny island nation. According to Ambassador Bristol, for many Grenadians alive during that era emotions are still raw with some considering the action an invasion and others an intervention depending on their perceptive. She characterizes the relationship between the United States and Grenada as a good one and portrays the Obama Administration as “very open and receptive.” One such example of close cooperation is the fight against the transshipment of drugs. Whether it is through her leadership at the OAS, her work with the U.S. government, her efforts to attract investment, or her educating the American public at large, one thing is clear—Grenadian Ambassador Bristol has made great strides in raising the profile of her homeland. And given her compelling story and personality, it is likely she will take that awareness to even further heights.